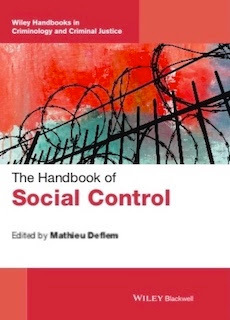 This is a copy of the introduction to The Handbook of Social Control, edited by Mathieu Deflem. Hoboken, NJ: Wiley-Blackwell, 2019. Please cite as: Deflem, Mathieu. 2019. "Introduction: Social Control Today." Pp. 1-6 in The Handbook of Social Control, edited by Mathieu Deflem. Hoboken, NJ: Wiley-Blackwell. The concept of social control has a long history in the social sciences, dating back to the very earliest days of the institutionalization of the discipline of sociology. In an earlier volume of this series of Wiley handbooks that concerned the concept and area of deviance (Goode, 2015), I provided a comprehensive overview of the concept of social control along with a review of its main theoretical perspectives and areas of empirical research (Deflem, 2015). It will suffice in this Introduction to first briefly summarize from that chapter. I will then, more importantly, situate the chapters of this handbook in that context to provide a general overview to this volume as a more or less coherent collective. When the concept of social control was introduced in the late 19th century, it was defined in terms of the whole of institutions that provided the foundations of social order in modern societies characterized by increasing levels of individualism and diversity (Carrier, 2006; Deflem, 2015; Martindale, 1978; Meier, 1982). This notion of social control as the foundation of social order in modern societies was most famously developed by Edward A. Ross (1901) from an institutional viewpoint and found a micro-theoretical expression in the work of George H. Mead (1934). Since those early days, however, social control has come to be conceived more specifically in terms of the control of norm violations, including informal norms in relative small social settings as well as more and highly formalized norms in large-scale societies. To this day, there are multiple connotations involved with the term social control, ranging from very broad concepts of social order (Janowitz, 1975; Gibbs, 1994) to very specific understandings within a particular theoretical tradition (Black, 1997; Cohen, 1985). Yet, for purposes of this volume, the chapters will show, the emphasis is primarily on social control in relation to deviance and/or crime. Such a criminological understanding, however, does not prevent an informed perspective of social control within a broader, both social an sociological, context. In view of theoretical differentiation in sociological thinking, it is instructive to distinguish between at least three relevant conceptions of social control in terms of deviance and/or crime (Deflem, 2015). First, in sociological crime-causation theories, primary attention goes to the causes of crime, with a related focus on social control as a functional response to crime. Second, crime-construction theories devote central attention to social control as criminalization in a broader process of the labeling of deviance. Three, conflict-sociological perspectives build on the constructionist viewpoint to articulate social control as part of a broader study (and critique) of society. From these various theoretical perspectives, social control provides a central framework from which social scientists, especially in criminology and sociology, study institutions and practices involved with the control of crime and/or deviance (Cohen, 1985; Chriss, 2013; Garland, 2001; Melossi, 1990; Pfohl, 1994). The delineated understanding of social control in terms of crime and/or deviance is by far the most widespread manner in which the concept is used today. On occasion, the term is also applied to other social behavior of a more or less problematic quality, such as illness and poverty, to contemplate on the social-control functions of institutions such as medicine and charity (van Leeuwen, 2000). Yet, the center of attention in studies of social control mostly rests with the control of crime and deviance at multiple levels of analysis, ranging from social control activities at the level of the interaction order to the macro level of multiple institutions involved with the administration of law, policing, and punishment. Recently, the sociological study of social control has especially focused on the influence of technological advances of crime control, typically under the heading of a new field of so-called surveillance studies, and has additionally centered attention on the influence of processes of globalization, such as the response to international terrorism. It is within this intellectual tradition that the chapters in this volume demonstrate the rich heritage of the major relevant perspectives of social control to provide an overview of the most important theories and dimensions of social control today. Within the suggested context, the present handbook of social control provides an overview and discussion of selected perspectives and dimensions of social control today. The volume includes 32 chapters on various aspects of social control divided over seven thematic parts, including: theoretical perspectives; social control institutions; law enforcement; criminal justice agencies; punishment and incarceration; surveillance; and global dimensions. Throughout the discussions, it will be shown, the chapters reflect the theoretical and methodological diversity that exists in the study of social control and are likewise thematically diverse within the scope of the volume. The first part of the handbook on “Theories and Perspectives” contains several chapters to clarify the most salient theoretical and conceptual issues involved with the social-scientific study of social control. These chapters trace the development of the concept and its place in sociology and criminology and devote attention to specific conceptualizations and perspectives of social control from a variety of approaches and theoretical frameworks. James J. Chriss does a great job of tracing the intellectual journey of the concept of social control in American sociology, while Robert Meier unravels the connections between deviance, social control, and criminalization. Expanding on the notion of social control in more specific theoretical contexts, Javier Treviño elucidates the conception of law as social control since E.A. Ross, while Bradley Campbell and Jason Manning explain the more contemporary understanding of social control from the viewpoint of (Donald Black’s) pure sociology and Steven Hutchinson and Pat O'Malley do the same in terms of (Michel Foucault’s) twin notions of discipline and governmentality. The chapters of Part 2 on “Institutions and Organizations” consider the various societal organizations and agencies that, at multiple levels of governance, are involved with the planning and execution of social control mechanisms for a variety of objectives. At the upper level of societal organization, the modern state takes up a central place, but at lower levels, a host of intermediate institutions engage in social control practices as well. Among them, this part focuses on multiple contexts, including organizations, psychiatric care institutions, juvenile justice, and social movements. Focusing on social control in organizations, Calvin Morrill and Brittany Arsiniega show the role of social control as both a dependent and an independent variable in organizational research. Focusing on two special domains in which control is exercised, Bruce Arrigo and Heather Bersot unravel some of the dynamics of psychiatric control and Shelly Shaefer untangles the web of juvenile justice. Sherry Cable offers a useful concluding reflection to this part by focusing on the role of social control in relation and, usually, in opposition to social movements of various kinds. It is important that this handbook is conceived as a social-science work on social control rather than a criminal justice administration book focused on technical issues of professional expertise. However, it would be absurd to leave out relevant contemplations on the role of criminal justice in society. Rather than merely describing systems of criminal justice, however, the third part of the handbook focuses on analyzing the patterns and dynamics of criminal justice practices and mechanisms, such as the relevance of race, gun control, crime prevention, and the development of restorative justice. There is no getting around some very definite and oftentimes problematic characteristics of criminal justice. In the United States, in particular, but elsewhere as well, one cannot be blind to the relevance of race and the role of guns, aspects tackled in the respective chapters of April D. Fernandes and co-author Robert D. Crutchfield and Gary Kleck. Broader trends of criminal justice today must also involve consideration of restorative justice, addressed in the chapter by Holly Ventura Miller and Rachel Rogers, and the role of risk and prediction, which, from rather different angles, are explored in the chapters on crime prevention by Kristie Blevins and on actuarial justice by co-authors Johann Koehler, Gil Rothschild, and Jonathan Simon. Ever since Max Weber’s theory of the state, the institutions of police and military have been central topics of reflection as among the most critical means of coercion. The transformation of policing in terms of crime control and order maintenance and its professionalization stand among the most relevant dynamics. The fourth part of the handbook, “Law Enforcement and Policing,” addresses various issues concerning the function, organization, and practice of policing. Among the topics are the history of the police function, the role of technology in policing, counterterrorism policing, and police ethics. Massimiliano Mulone starts off this section, as one must, by tracing the historical origins of the institution and practices of policing, while James Willis’s chapter, with similar necessity, discusses the role of technology in policework. At least since September 11, likewise, it would be unwise to not consider the role of policing in counterterrorism, which I and co-author Stephen Chicoine explore in institutional terms on a national and global level and which Derek Silva analyzes with regard to radicalization as a new central framework of counterterrorism. With today’s discussions on police violence and police legitimacy, finally, the chapter on police accountability and police ethics by Toycia Collins and Charles F. Klahm serves a more than useful role in this discussion of policing as social control. Part 5, “Punishment and Prisons,” considers another critical aspect of the criminal justice system within the broader constellation of social control. At least since the seminal work of Emile Durkheim, social scientists have rightly contemplated on the transformation of punishment towards less severe but more manipulative forms as well as towards the generalization of the deprivation of liberty in the form of the modern prison system. This part of the handbook will devote chapters to the most important components of these dynamics, including the history of incarceration, the dynamics of prison culture, the problem of mass incarceration, the resistance of abolitionism, and the death penalty. Ashley Rubin traces the history of the prison as a series of overlapping periods in which new templates of imprisonment diffuse. Next, Laura McKendy and Rose Ricciardelli discuss prison culture in terms of the tensions between collectivism and individualism. Roy Janisch discusses the important problem of mass incarceration, while co-authors Nicolas Carrier, Justin Piché, and Kevin Walby discuss the altogether different but highly related problem of abolitionism and decarceration policies and programs. Paul Kaplan, finally, examines the death penalty from an informed social-science viewpoint that is intent on analyzing the facts of the case of this most peculiar form of social control. Technology places a central role in our daily lives and in many facets of the social order, including indeed social control. In recent years, much work has been conducted in this area under the heading of surveillance and a new field of surveillance studies. The chapters in Part 6, “Surveillance,” will analyze relevant aspects of what is often called the surveillance society. Stéphane Leman-Langlois starts off the discussion, appropriately, by focusing on the role of technology. Kiyoshi Abe next analyzes the shifting boundaries of surveillance in its manifestation in public spaces. Turning to the limits of surveillance, James Walsh discusses the potentials and limitations of countersurveillance strategies, while Anna Rogers discusses the more or less playful and critical ways in which surveillance is treated in various forms of popular culture. It has been a truism for quite some years now to observe that the world is getting smaller as its varied localized events are more and more interconnected. The world of social control has not remained unaffected by these globalizing trends. Certain developments of an international and transnational character in matters of social control have intensified and others have changed qualitatively. The final part of the handbook, under the heading of “Globalization”, focuses on such border-transcending yet also border-affirming phenomena associated with social control. Indicating the continued relevance of national borders, the chapters by Alexander Diener and co-author Joshua Hagen and by Samantha Hauptman discuss the dynamics of border control and immigration policies, respectively. Turning to dimensions of global social control closely related to political affairs of violence and war, Michael Jenkins and John Casey discuss the major forms of international peacekeeping, while Joachim Savelsberg and Brooke Chambers bring our handbook to a close by providing an informed analysis of more and less formal dimensions of social control designed and enacted in terms of violations of human rights. This handbook on social control may be justified both because of its academic usefulness and pedagogical value. Indeed, existing edited volumes that explicitly deal with social control from a criminological and sociological viewpoint are by now several years old. Among them, for instance, are the collections of articles and chapters on social control edited by Jack Gibbs (1982), Donald Black (1984), and Stanley Cohen and Andrew Scull (1985), all of which were published some three decades ago. A similar edited volume, on social control and political order, is now more than twenty years old (Bergalli & Sumner, 1997). More contemporary edited volumes on social control are available, yet they either address a wide and rather incoherent variety of different components of social control (Chriss, 2010; Downes, Rock, Chinkin, & Gearty., 2008) or are, instead, focused on more specific aspects of control, such as punishment (Blomberg & Cohen, 2012; Deflem, 2014; Simon & Sparks, 2012), policing (Deflem, 2016), and surveillance (Ball, Haggerty, & Lyon, 2014; Deflem, 2008; Norris & Wilson, 2006). Likewise, many of the existing handbooks and encyclopedias in the area of social control are very broad in scope to focus on a wide variety of aspects and approaches to the study of crime and/or deviance and its control (Albanese, 2014; Bruinsma & Weisburd, 2014; Inderbitzin, Bates, & Gainey, 2015; Tonry, 2013), while other such works are more specialized in their orientation to focus on such issues as policing and punishment (Tonry, 2000; Reisig & Kane, 2014). Therefore, because of its distinct focus on the concept of and aspects as well as theories associated with social control, this handbook fills a void scholars of crime, deviance, criminal justice, and related areas and issues should appreciate. It also fits well with the related handbooks published by Wiley Blackwell, such as the volumes edited by Erich Goode (2015) on deviance, by Alex Piquero (2015) on criminological theory, and by Austin Sarat and Patricia Ewick (2015) on law and society. Pedagogically as well as academically, our handbook on social control hopes to fulfill a distinct and unique, yet complementary role. The preparatory and editorial work involved in bringing this handbook to fruition has a history too long and unnecessary to be recounted here in any detail. Suffice it to say that the economics of academic publishing are presently undergoing rather drastic changes. Originally conceived as an encyclopedia, the volume was redesigned as a handbook following a series of events far beyond the realms of intellectual consideration. Eventually, these revisions and delays were most fortuitous as they enabled this handbook to appear in the series of “Handbooks in Criminology and Criminal Justice” that are so ably edited by Charles Wellford. Upon submission of a proposal and the final review of this handbook’s chapters some 942 emails later, I am grateful to Dr. Wellford for his graciousness in evaluating the idea of this volume on nothing but sound academic grounds. As this project moved to completion, I also thank the many fine folks at Wiley who oversaw the production of this volume. Finally, of course, I am grateful to the invited authors for writing their chapters and to the reader who will enjoy the fruits of their labor. Albanese, J.S., (Ed.) (2014). The encyclopedia of criminology and criminal justice. Malden, MA: Wiley Blackwell. Ball, K., Haggerty, K., & D. Lyon (Eds.) 2014. Routledge handbook of surveillance studies. London: Routledge. Bergalli, R., & C. Sumner (Eds.) 1997. Social control and political order. London: Sage. Black, D. (Ed.) (1984). Toward a general theory of social control. Two volumes. New York: Academic Press. Bruinsma, G., & D. Weisburd (Eds.) (2014). The encyclopedia of criminology and criminal justice. Berlin: Springer. Chriss, J. J. (Ed.) (2010). Social control: Informal, legal and medical. Bingley, UK: Emerald. Chriss, J. J. (2013). Social control: An introduction. 2nd ed. London: Polity Press. Cohen, S., & A.T. Scull (Eds.) (1985). Social control and the state: Historical and comparative essays. Oxford: Basil Blackwell. Deflem, M. (Ed.) (2008). Surveillance and governance: Crime control and beyond. Bingley, UK: Emerald. Deflem, M. (Ed.) (2014). Punishment and incarceration: A global perspective. Bingley, UK: Emerald. Deflem, M. (2015). Deviance and social control. In E. Goode (Ed. ), The handbook of deviance (pp. 33-40). Malden, MA: Wiley Blackwell. Deflem, M. (Ed.) (2016). The politics of policing: Between force and legitimacy. Bingley, UK: Emerald. Downes, D., Rock, P., Chinkin, C., & C. Gearty (Eds.) (2008). Crime, social control and human rights: From Moral Panics to States of Denial. London: Routledge. Garland, D. (2001). The culture of control. Chicago: University of Chicago Press. Gibbs, J. (Ed.) (1982). Social control: Views from the social sciences. Beverly Hills, CA: Sage. Goode, E. (Ed.) (2015). The handbook of deviance. Malden, MA: Wiley Blackwell. Inderbitzin, M., Bates, K., & R. Gainey (2015). Perspectives on deviance and social control. Los Angeles: Sage. Maguire, M., & R. Morgan (Eds.) (2012). The Oxford handbook of criminology. Oxford: Oxford University Press. Martindale, D. (1978). The theory of social control. In J.S. Roucek (Ed. ), Social control for the 1980s: A handbook for order in a democratic society (pp. 46-58). Westport, CT: Greenwood Press. Melossi, D. (1990). The state of social control: A sociological study of concepts of state and social control in the making of democracy. Cambridge: Polity Press. Norris, C., & D. Wilson (Eds.) (2006). Surveillance, crime, and social control. Aldershot: Ashgate. Pfohl, S. (2009). Images of deviance and social control. Second edition. Long Grove, IL: Waveland Press. Piquero, A. (Ed.) (2015). The handbook of criminological theory. Malden, MA: Wiley Blackwell. Reisig, M.D., & R.J. Kane (Eds.) 2014. The Oxford handbook of police and policing. Oxford: Oxford University Press. Sarat, A., & P. Ewick (Eds.) (2015). The handbook of law and society. Malden, MA: Wiley Blackwell. Simon, J., & R. Sparks (Eds.) (2012). The SAGE handbook of punishment and society. London: Sage. Sumner, C. (Ed.) (2004). The Blackwell companion to criminology. Malden, MA: Blackwell. Tonry, M. (Ed.) (2000). The handbook of crime and punishment. Oxford: Oxford University Press. Tonry, M. (Ed.) (2013). The Oxford handbook of crime and criminal justice. Oxford: Oxford University Press. See more information about this book, including chapters and authors.